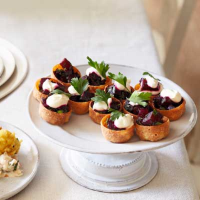 These dainty, hot canapés are perfect as a nibble or starter with drinks. 1. Preheat the oven to 200ºC, gas mark 6. Place a large piece of foil into a roasting tin and top with a sheet of baking parchment of the same size. Place the beetroot in the centre. 2. Add the redcurrant sauce, orange juice, oil, thyme and some seasoning. Gather up the parchment and foil and squeeze together to make a tightly sealed parcel. Bake in the oven for 1 hour or until the beetroot is tender. Leave to cool completely in the parcel. 3. Remove the skin from the cooled beetroot with a vegetable peeler, then finely dice the flesh and place in a bowl with the cooking juices. Cover and chill until needed. 4. About an hour before serving, mix the horseradish with the crème fraiche and season. Cover and chill until needed. 5. To assemble, gently warm the beetroot through in a small pan. Remove from the heat and stir in the chopped parsley. Warm the croustades according to the pack instructions. Spoon the beetroot into the croustades, draining off any cooking juices, and top with a little horseradish sauce and a parsley leaf. Serve straight away.